The Javelin's story begins similarly to that of many RAF aircraft - a succession of requirements accompanied by a succession of ever-changing designs to match. In 1947 the Air Ministry had seen the need for a high performance interceptor to challenge the increasingly modern bomber designs being produced. 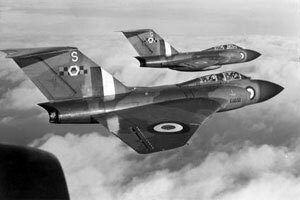 Two separate aircraft were envisaged; one for day and for night fighting. While the day fighter eventually led to the Hunter, the night/all-weather fighter requirement was down to a fight between Gloster and de Havilland (the latter submitting their DH.110, later to become the Sea Vixen). The specification was numbered F.44/46, and three each of the de Havilland DH.110 and the Gloster GA.5 were ordered. The F.44/46 specification matured to become F.4/48, covered by operational requirement OR.227, which called for a fighter capable of 525 knots at 40,000, armed with 4 30mm cannon and 4 AAMs with a powerful radar. 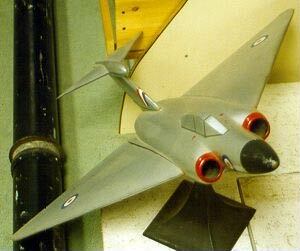 Gloster settled on a design (based on proposal P280) for a huge delta-winged aircraft with two RR Avon engines before rising weight forced them into selecting higher-thrust Sapphire engines instead. In the meantime a further two DH.110s were ordered, but the order for Gloster's submission was cut to two, the thinking being that the DH.110 was more likely to succeed. Gloster were not overjoyed at this; two prototypes were going to make slow going if the aircraft was chosen for service, and in 1951 a change of thinking at the Air Ministry finally persuaded them to order three more GA.5s. Later in the year the first prototype flew, on 26th November. WD804 was the aircraft in question and was a bare shell - no radar, no weapons. Serious vibration problems linked to the exhaust and airflow over the rear fuselage meant several redesigns of this area were called for. In June 1952 WD804 lost both elevators on a high speed run and the pilot, Sqn Ldr Bill Waterton (Gloster's chief test pilot) managed to land at Boscombe Down using the electrically-operated tailplane trimmer for pitch control - an very tricky bit of flying, for which he received the George Medal. The first production order had arrived, and with it the name of Javelin. The second prototype, WD808, flew in August but then stayed on the ground until January 1953 while research went on to determine the cause of the aileron loss. Tests throughout the first half of the year resulted in a number of changes to the design, including a cranked wing and beefed-up fuselage, fin and control surfaces. However it was at this point the Javelin's high T-tail cost the life of pilot Peter Lawrence - such designs are susceptible to a condition known as a deep stall, where the wing blankets airflow over the tail assembly at high angles of attack, rendering the aircraft uncontrollable. 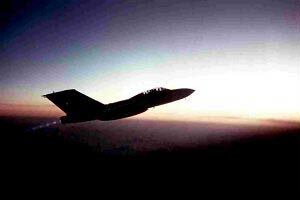 At some point in the flight the nose had been pulled past 45 degrees and as the stall came on forward airspeed reduced to zero - the aircraft simply fell out of the sky. 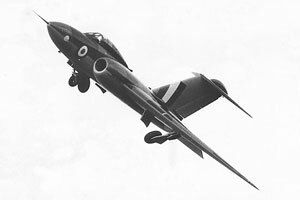 In March 1953 a third prototype (WT827) flew, being the first one to carry guns and radar. A number of differing radome designs were tried before they settled on the familiar pointed design. 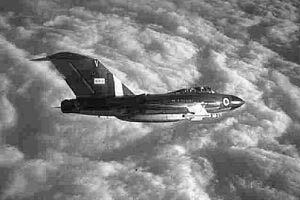 Large belly tanks were also fitted, as it was recognised the Javelin was lacking on fuel. A fourth prototype (WT830) flew in January 1954 and though lacking guns and radar, it did incorporate all the improvements made to the ill-fated second prototype, including powered ailerons. It soon passed to the A&AEE at Boscombe Down to be assessed by RAF pilots. 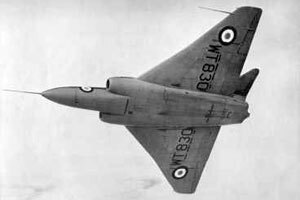 The fifth and final prototype, WT836, joined the flying programme in July, the same month in which one of the earlier prototypes was flown at through the sound barrier over London, the ensuing sonic boom causing a hell of a lot of fuss. Gloster's official position was that this was an accident, but it was widely believed to be a demonstration that the aircraft could go supersonic - much press criticism, including from Bill Waterton (who had quit Gloster and was now a newspaper correspondent), had said it could not. 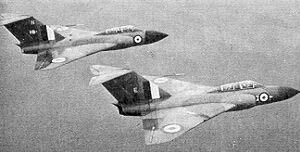 While possible export customers settled down to watch the progress of the programme before expressing any real interest (and soon losing any they had), by mid-1956 over 20 FAW.Mk.1s were engaged in trials work - the type of development batch arrangement later formalised for production of later types such as the Lightning. Despite the designation of FAW.1, none of these aircraft were ready for real service - while 46 and later 87 Squadrons played with their new toys, they were covered by many limitations on the flight envelope and they were not missile armed. The FAW.2 introduced a new American radar (the APQ.43, instead of the FAW.1's AI.17), with a larger radome, and went into service with 46 and later 89 Squadrons. The next variant was a trainer, the T.3, with tandem seating to avoid major changes to the design, all-moving tailplane but no radar. The change in centre of gravity meant a small fuselage extension was required, and this was used to house extra fuel (and make the aircraft substantially better looking in the process!). 228 OCU at Leeming received most of the T.3s but they were also spread around the various Javelin squadrons. The FAW.4 was similar to the FAW.1 but had the T.3's all-moving tailplane and vortex generators on the wings and entered service with 141 Squadron at RAF Horsham St. Faith, and later with 3, 11, 23, 41, 72 and 87 Squadrons (though not all simultaneously). The FAW.5 was externally similar to the FAW.4 but had a redesigned wing interior in order to make room for more fuel, and provision for the full total of four Firestreak AAMs - though in the end the mark never carried them. The wing improvement of the FAW.5 was soon applied to the FAW.2, thus producing the FAW.6. In November 1956 the FAW.7, the first mark to actually carry the four missiles specified in the original requirement, first flew. Basically an FAW.5 but with uprated Sapphire Sa.7 engines and powered rudder and extended rear fuselage. By this time so many different marks of the Javelin were in the air it was a wonder anybody had any idea what was happening. A larger number of each mark were being used in various trials on such basic items as the weapons and engine fits, leading one to believe the Air Ministry had handed the RAF over to Gloster as one big Guinea Pig. The FAW.8, an FAW.7 with reheat, appeared so quickly that a full 80 FAW.7s never even saw service, being delivered straight into storage at RAF Kemble, and later converted to FAW.9s. It was not until June 1960 that an RAF Javelin - an FAW.7 - finally fired a Firestreak missile, successfully downing a Meteor drone. The reheat-capable FAW.8 was limited to using reheat only at a minimum altitude; below that point engaging the reheat actually caused a loss of thrust (to the point where take-off could not be safely accomplished with reheat engaged). This was down to the engine's fuel pump - it fed fuel at a constant rate and only at high altitude was there sufficient excess capacity to allow fuel to be burned directly without causing a loss of cold thrust at the same time. However the FAW.8 did have an improved, drooped, wing leading edge and autostabiliser to improve handling. The FAW.9 was basically an FAW.7 incorporating the FAW.8 improvements, and lastly there was the FAW.9R, equipped with a fantastically ugly and massive refuelling probe, obviously designed by somebody who took the name of the aircraft a little too literally. In service the Javelin had settled down to do a steady, unspectacular job of guarding the nation against the expected Soviet bomber fleets - and while designed as a medium range bomber destroyer, and subject to many restrictions on how it was flown, could put up a creditable performance against other aircraft of the same time - no contest against the upstart Lightning, but a fairly even match for a Hunter. Ironically the Sea Vixen could outperform the Javelin, having none of the latter's restrictions, but lacked guns so by the time it came to a close-in dogfight, the Sea Vixen pilot would have been helpless to do anything other than try the rarely used rocket pack, or hurl abuse over the radio. The Lightning replaced the Javelin in the UK and Germany in short order with most being gone by 1965, but the Javelin held on for a few years longer in the Far East, where it gained its only air to air victory - an Indonesian C-130 which crashed while trying to avoid a Javelin that had been sent to intercept it during the Malayan crisis in 1964. But with the increasing success of the Lightning, the Javelin's days even in hotter climes were numbered, and the last Javelin squadron was 60 Squadron, disbanding at RAF Tengah on Singapore, at the end of April 1968. Ironically, while the Javelin had been preferred over the DH.110 because it was considered to offer more potential to develop further variants, all of the really interesting proposals fell by the wayside and were never to see daylight. These included reconnaisance variants with extended noses and/or a greater wingspan, an attack version to carry bombs in under-fuselage panniers and most significantly a supersonic version with area-ruled fuselage, thinner wings and redesigned tail unit. This was being seriously explored when it was cancelled, and soon after Duncan Sandys' infamous Defence White Paper was published, cancelling most advanced aircraft projects. Gloster spent the years between this point and their absorption by BAC desperately trying to get back into the game, but never succeeded, and the Javelin was the final production type that Gloster produced. The Javelin's protracted development period and lack of opportunity to prove itself in combat have led to it being described in scathing terms by many people, and its reputation was not helped by logistical and servicing mishaps in deployments overseas, but it was well liked by its pilots who appreciated the amount of weaponry available to them (far exceeding other types of the day), its stability (within the proscribed guidelines) and its roomy cockpit. Any shortcomings it had in dogfighting ability were more than outweighed by its ability to stop the fight before the proverbial 'knife fight' began, and its airbrakes were incredibly effective - enough to force an attacker to overshoot before they realised what was happening, and often used to permit impressively steep descents to landing. A single Javelin continued to fly with the RAE until 1976, when it was delivered to the Imperial War Museum's care at Duxford airfield, where it remains to this day. Lacking in any real popularity with the public, the large production run has sadly not been reflected in numbers of preserved examples, and a mere 10 complete Javelins now remain in various states of preservation, none of which will ever fly again. 24 Aug 1956 (prod) 15 Jan 1957 (proto) 9 Nov 1956 (prod) 9 May 1958 (prod) 1959? Production totals for each variant include converted airframes. Corrections and gap-filling welcome as always! Externally the various variants can be confused, though there are a number of points to look for. The T.3 is easy to spot, with a tiny black radome. The FAW.1/4/5 and 2/6 are tricky to tell apart! The FAW.9R is identical to the FAW.9 unless the refuelling probe is actually fitted in which case it's obviously a 9R.